This morning, I registered my car to the Land Transportation Office (LTO) for the mandatory annual vehicle registrations. This is the 3rd straight year I see this in my registration certificate -- "Sticker Not Available". 5. Legal research fund, P10. Ordinary sedans would have lower MVUC while SUVs and luxury cars would have higher MVUC. Mine is a pick up. On #1, this is a controversial tax, I think it is not clear where the money goes, who or what agencies spend how much. Tens of billions of pesos yearly is collected from this tax alone. #s 2 and 4 are missing. I was told to come back after 4-5 months to get them. Continuing LTO inefficiency here. #3, ???? There is a cost to the use of LTO computers, passed on to the motorists? But LTO gets its annual budget from our tax money. The MVUC should have covered this and other costs. Anyway, one does not go straight to the LTO for the car registration. 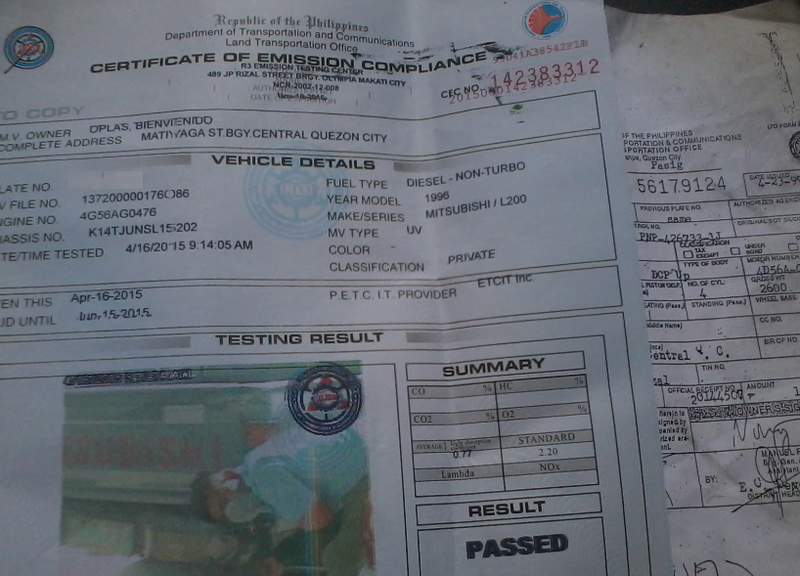 One must get this emission certificate first. The cost is P450. 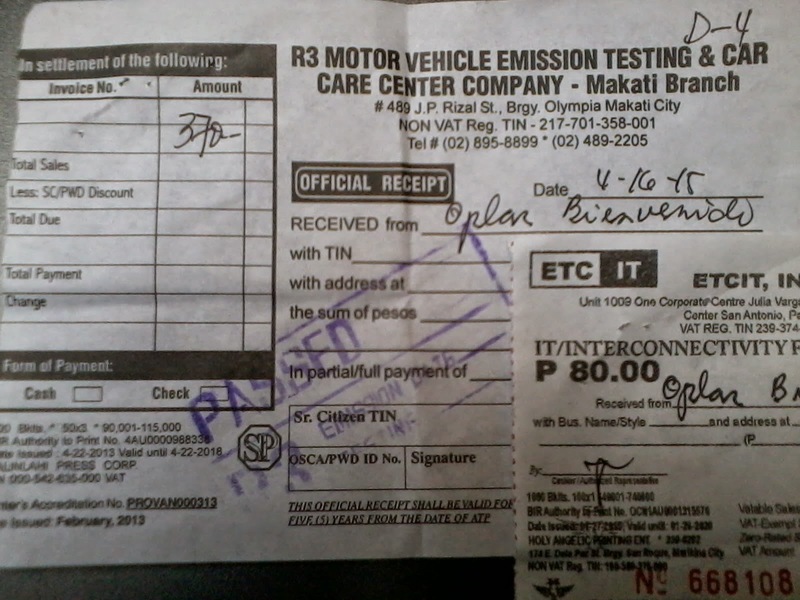 Emission test fee P370 + IT/Connectivity fee P80. Am wondering what is this "connectivity fee" and where does the money go. So the total cost for a car registration is P2,680 + 450 + 600 = P3,730. Plus fuel going to the emission test center, LTO, tips to the emission test guy, stencil guy. In fairness to the LTO, it took me only about 40-45 minutes from the time I entered LTO Makati office to the time I got out. There is faster procedure now, little queuing. Until last year, it took me about 1:20 hour. Getting the emission test is longer. I went to the test center around 7:15 am, got a queuing number and was told to come back around 9am because there are many vehicles ahead of me. Them who were not accommodated the previous day, or were there before 7am. I came back 9am, was out after about 40 minutes. 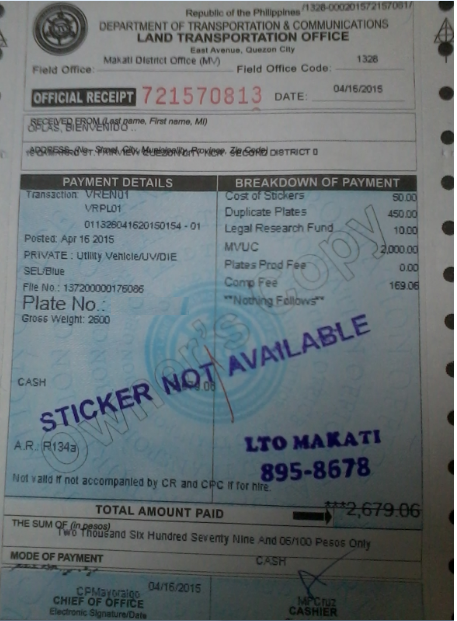 LTO bureaucracy is still bad with those "Sticker not available" and "Plates not available" notes. This should not be happening. You get our money, you should deliver those permits. Plus various mandatory costs like emission tests, computerization fee, etc. One saving grace for LTO is that it is now much faster, easier, to register our vehicles. Give credit where it is due. Thanks LTO for this improvement. Thank you for sharing the insight! Your article is very helpful and informative. I would like to read more updates from you. I absolutely love your blog and find most of your post's to be precisely what I'm looking for. Would you offer guest writers to write content for you? I wouldn't mind writing a post or elaborating on most of the subjects you write about here. Again, awesome site!